Personally, I thought that my mother’s description of the sandwich sounded pretty weird, and I was not eagerly anticipating the day when she would make one for me. In fact, when she commented at the end of Thanksgiving weekend that she had forgotten to make me a Zorba, I was secretly happy I had managed to avoid the taste test. “It’s okay, Mom.” I told her. “We had so much turkey and other stuff, we really didn’t need them. I’ll be home again. We can try it then.” I was hoping that she would forget. What I didn’t know was that she made these sandwiches for my father at least once a month. 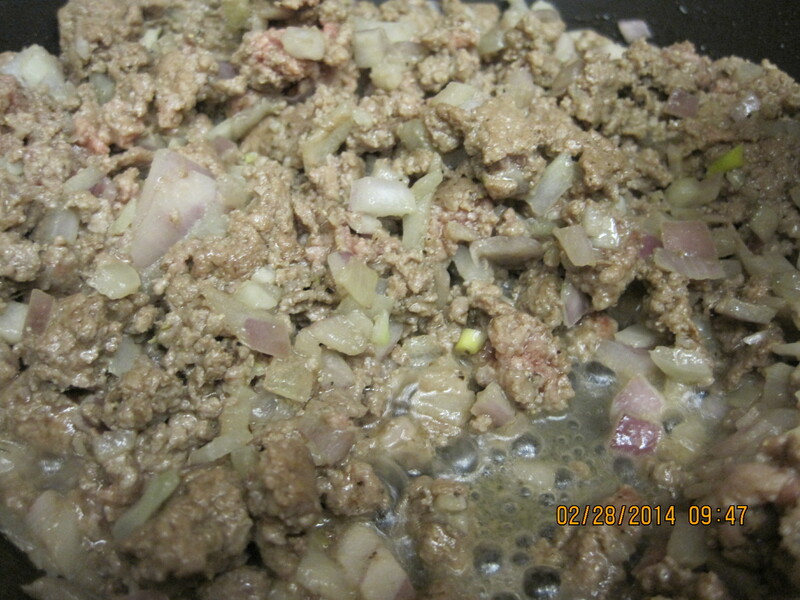 It was when I came home for Christmas break that she finally was able to make the Zorba for me. I stood in the doorway to her kitchen which was near her stove and talked with her about the things going on at school as I watched her prepare this strange sounding mixture. 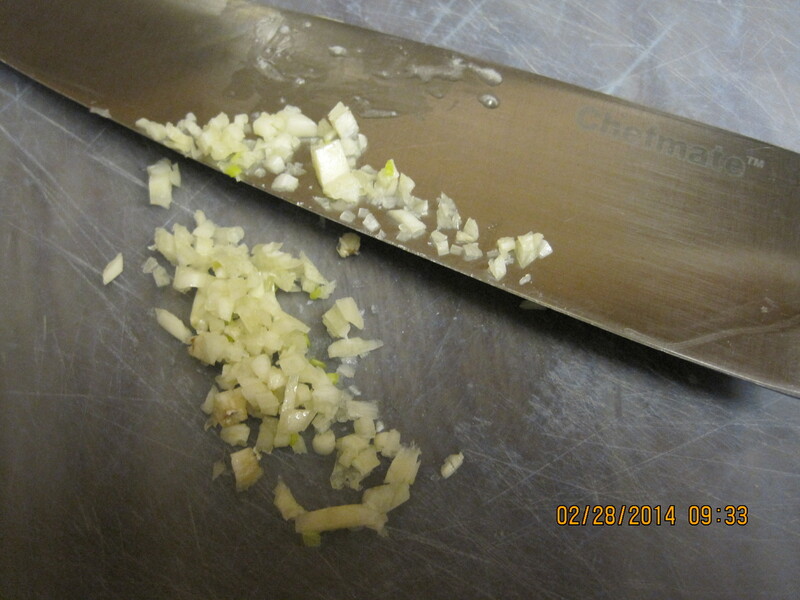 First, she chopped up some garlic. 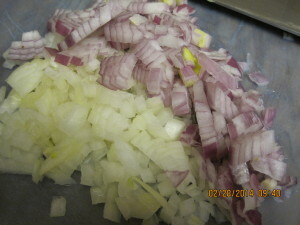 Then she chopped up some onion. She probably only used one type of onion but I had two half onions sitting in the fridge. 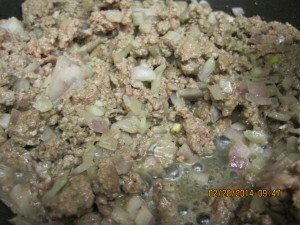 Then she put all of it into the pan with some ground beef. She cooked this until the meat was browned. 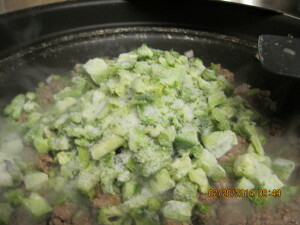 Then, she stirred in frozen chopped broccoli. 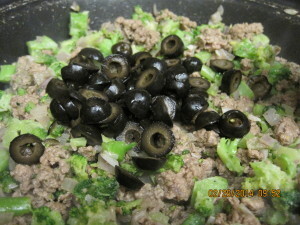 Finally, she added a 2.5 ounce can of sliced black olives that had been drained. I have been known to use a 4.25 ounce can of chopped black olives instead. 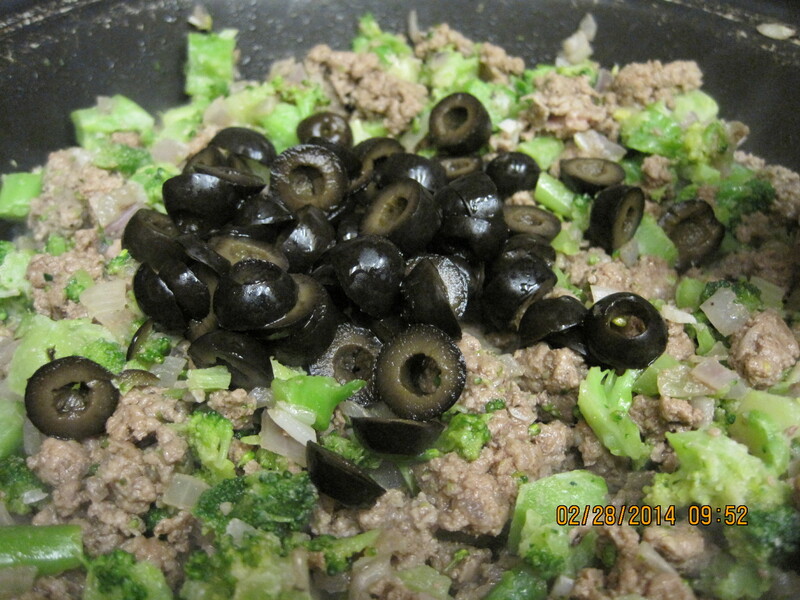 She continued to cook this mixture, adding black pepper and salt until the broccoli was cooked to her liking. I usually add only black pepper because of the saltiness of the olives, but my mom always complained that I don’t use enough salt when I cook. Taste it and decide for yourself. 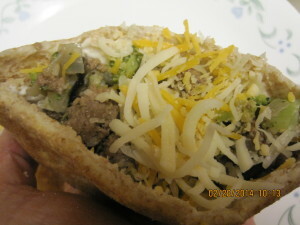 The mixture was then served inside pita pockets that had been spread with mayonnaise, and served topped with shredded cheese. During Spring break, my mom wanted me to go with her to try the original sandwich upon which she had based her recipe. We drove 30 miles, and after completing some other errands, we stopped at the diner. After studying the menu, we couldn’t find the Zorba anywhere. My mom summoned the waitress who was new. She brought out the manager, and he told her that, sadly, the sandwich was no longer available. 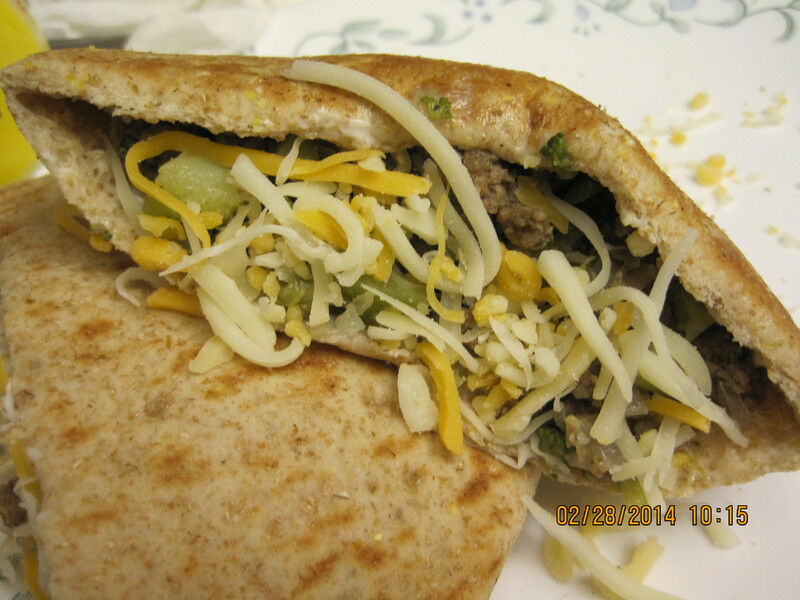 I don’t remember what we had for lunch, but I remember that I liked my mom’s Zorba Sandwich. When I got back to the college, I made it for my boyfriend. He really liked it, too. He’s now my husband. I can’t promise that Zorba sandwiches will turn your boyfriend into your husband, but it worked for me. In fact, he’s the one who is responsible for this post. I asked what he wanted for dinner, and he said “You know something that you haven’t made in a long time? Zorbas.” Baker’s Man is really an awesome guy. Of course, I might be prejudiced. Here’s the recipe. Please give it a try and let me know what you think. A remake of a sandwich my mother and father ate at a diner in a neighboring town. You can add some shredded lettuce and chopped tomatoes to the sandwich if you like. If pita bread is expensive in your area, use flour tortillas and roll up burrito style. Total Cost of Recipe = $9.82 or $1.64 per serving. 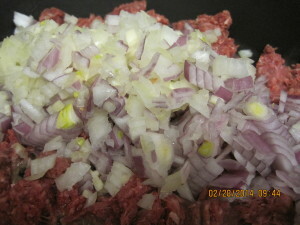 Cook garlic, onion, and ground beef together in a skillet until meat is browned and onion is translucent. Add frozen chopped broccoli and cook, stirring frequently until broccoli is nearly cooked. 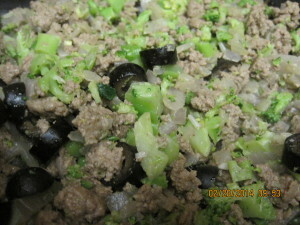 Add olives, and heat until broccoli achieves desired degree of doneness and olives are heated through. Cut pita's in half and open the pockets. Top with a couple pinches of shredded cheese. I thought this recipe sounded weird,but I gave it a try. I was great. I’m definitely making this again. I agree that it sounds weird. That’s why I was trying to avoid my mom making them for me, but once I tasted it, I was hooked.